The Florida Aquarium is one of the top aquariums in the country, with over 20,000 aquatic creatures, including sharks, otters, alligators and many more. Walk along the Wetlands Trail past alligator-infested waters to the river streams where otters play and explore. Then stroll along the boardwalk and touch a variety of different species of stingrays and sharks at a touch pool called Stingray Beach. Look for white-spotted bamboo sharks, coral catsharks, southern rays and more. See penguins right up close. Check out Ocean Commotion, a colorful exhibit with unique jellies, colorful clownfish, a pacific octopus, and more. And don’t forget to check out the outdoor water fun zone for children called Splash Pad. Check out the one-of-a-kind view at the Coral Reef Gallery, one of the most beautiful and diverse ecosystems in the world. Splash Pad is 2.2 acre aquatic discovery zone for kids. Bring swim suits for the kids who are invited to play in in the outdoor plaza (weather permitting) at the rain-forest themed water feature with dump buckets and waterworks, plus net climbs, slides and more. Best of all - it's free with regular admission! Fins Bar provides an area for parents to enjoy refreshments, relax and watch their children play. Stop by the Avian Research Center in the Main Lobby to meet Black Footed African Penguins. Learn fascinating facts about this endangered species. 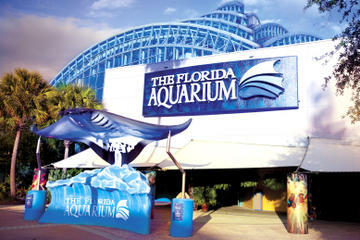 See their schedule in the Visitors Guide when you arrive at the Aquarium. The country of Madagascar is known as a biodiversity hotspot; this gallery will take you through the wildlife and landscapes of the world's fourth largest island, where you will see ring-tailed lemurs, hissing cockroaches, chameleons and an Indian Ocean coral reef. Your adventure begins under a spectacular glass dome, home to freshwater fish, free flying birds, playful river otters, Florida alligators, and a host of other inhabitants of Florida's wetlands. Climb a giant staircase to the towering mezzanine of the Wetlands Lookout for a bird's eye view of the entire gallery below. Maybe you've been to Florida's beaches, but do you ever wonder what's lurking below the surface? Take a walk under a bridge, stroll by the beach, and encounter seahorses, stingrays and spiny lobsters without ever getting wet. You'll see the life of Florida bays and shorelines upclose and in awe-inspiring detail. Plunge into the awesome underwater world of a 60-foot dive for a one-of-a-kind look at a coral grotto. From clouds of colorful fish swimming in unison, to green moray eels hiding in dark crevices, it's a constantly moving parade of life. This unique No Bone Zone features invertebrates (animals without backbones), and is especially designed for the younger marine enthusiast with low tanks and plenty of hands-on opportunities. Great but read up on it. Kids can wear swimsuits and play in the water area etc. Food OK. Loud and kid friendly. Take your time going through...I saw people that just rushed through and you miss things above and below. be prepared for screaming kids and humidity. Great town. Overall very disappointed. Very small aquarium with limited viewing. It was a very good place to visit. My grandsons are 7 and 9 and they loved it. We really enjoyed the splash pad for the kids, they played and we got to relax and watch. Experience was very positive and informative..both adults and children enjoyed. Never knew there were so many fish in the world. Your visit here makes Sea World redundant. I was impressed with the size of the aquarium as I assumed Tampa would not have such a good facility. It was wonderful, Grand kids loved it and so did we. A place to see. Not as small as SeaLife Hannover/Germany but worth a trip to do. Don't forget to looks around the harbour area where the Aquarium has been built in. A good example for the new usage of old industrial waste land. Never seen such an amount of different animals in one complex ! Awesome Aquarium ! Clean and perfect tour round everything ! Highly recommended ! !